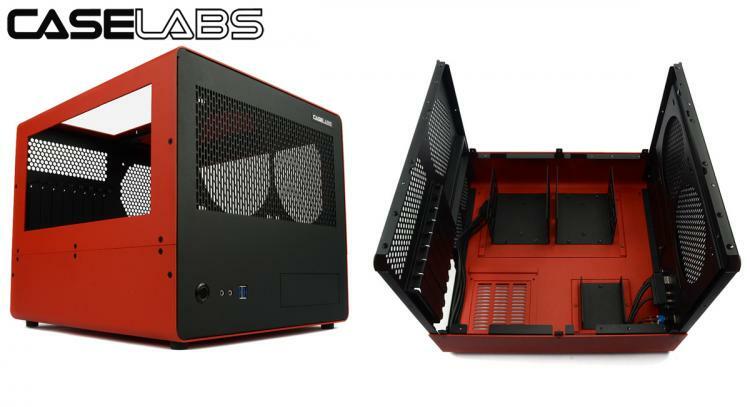 CaseLabs introduces the Bullet BH8 small form factor case that supports up to Extended-ATX motherboard form factor. The BH8 is just two inches taller than its predecessor, the BH7 chassis. With the added height comes more customization options and better hardware support which includes more PCIe slots, radiator space and others. The CaseLabs Bullet BH8 also sports a single 5.25-inch front bay for fan controllers, bay reservoirs, ODD and others. Bullet was designed from the ground up to provide optimum air flow and excellent cable management in a smaller format case. If you air-cool or use AIO coolers, this case was built for you. The BH8 is however big enough for a custom loop with proper planning. - Allow for very clean cable management. - Provide excellent cooling for air coolers (and AIO systems). - Provide good access, so you can get hands in and work on it. A common complaint of many SFF cases is - that they can be very difficult to work with. - Provide the ability to show off the interior of you build, take advantage of case lighting, sleeving, etc. In - this respect, we incorporated one of the most popular optional features of the S3 – dual side windows. - Provide a case that can get handled a lot without fear of damaging it or the components inside. To that effect, the drives are shock mounted and the MB & GPU are mounted horizontally to reduce stress when using heavy GPU’s. The exterior is a “hard shell” design made from heavy .090” (2.3mm) aluminium (the front and rear panels are made from .063” – 1.6mm). Optional handles are available.